Frutiger® Next is a Platinum Collection family, exclusively available from Linotype GmH and authorized partners. Released in 2000, it is a revised and extended version of the famous Frutiger typeface. 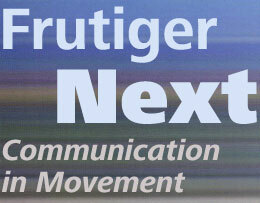 Frutiger Next is available either as an extended OpenType family, or in traditional PostScript and TrueType formats. The OpenType version includes seven weights (a new, Ultra Light weight was released solely in OpenType format in 2007). Each weight has upright, true Italic, and Condensed variants. All of the OpenType fonts also include small caps and oldstyle figures. No version of Frutiger has ever had such rich typographic features as Frutiger Next OpenType! Additionally, all of the OpenType fonts make use of Linotype’s Com character set, which supports 48 Latin-based languages from Western, Central, and Eastern Europe – even the Baltic languages and Turkish. The elder PostScript version is only available in six weights and without small caps and oldstyle figures. Frutiger® Next, along with Avenir® Next, Compatil®, Eurostile® Next, Optima® nova, Palatino® nova, Univers® Next (formerly Linotype Univers), Sabon® Next, and Syntax® Next (formerly Linotype Syntax), make up Linotype’s Platinum Collection. These fonts were carefully digitized, and have the high quality demanded by professional typography. All fonts in the Platinum Collection were produced according to the Linotype tradition of quality. Linotype and its authorized partners offer these fonts as Platinum Collections CDs or as single fonts or value packs. Search with the keyword for ‘Frutiger’ to find all fonts in the Linotype Library designed by Adrian Frutiger.